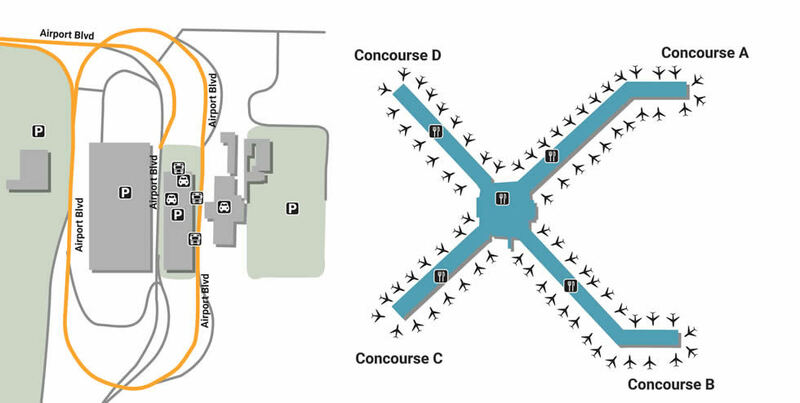 As you approach Pittsburgh International Airport you can get to Concourse A-D from Airport Blvd. and get to your flight quickly which has various places to eat while you wait for your flight. Located at the junction of 3 rivers, Pittsburgh is a scenic place to take a vacation or make a simple visit special. The Pittsburgh International Airport is a shining example of just how kind and helpful the city can be, the 4-star facility offering guests a first-hand look at what it truly means to be a Steeler. With four separate parking lots, Pittsburgh International offers a wide array of choices as well as ways to make your experience as swift as it is easy. You can reserve your parking at PIT airport making every step simple. Park at the Extended Term Lot for the lowest daily charge, or enjoy the moving walkway that leads straight to the terminal from the Long Term and Short Term Lots. If you’re a frequent flier looking for perks, head to the Gold Key Parking for monthly rates as well as heightened security. From interesting programs to helpful services, Pittsburgh International offers pretty much anything you can think of as well as things you’d never expect. There’s one nursing lounge open at Concourse C, right across from the children’s play area, Kidsport. There’s also free high-speed internet throughout the facility as well as pet relief areas located outside, adjacent to baggage claim. The facility is also home to Voices of Pittsburgh, a program set in place to welcome travelers on terminal trains with a familiar voice, the message depending on the current event happening in the region, whether it be a college reunion or a business expo. If you need to show up somewhere looking good, compliment your surroundings with the right footwear from ECCO, a business-casual shoe store that appeals to men and women in the Center Core shopping area. While you’re there, pick up some nutritional supplements at the GNC Vitamin Store, or get important toiletries from the Rite Aid across the way. If you need to replace a broken charger, pick up at the Fuel Rods Kiosk, an electronics store that prides itself on reusable/swappable merch from the convenience of Concourse A. While you’re at Concourse A, walk over to the massive Hudson Booksellers for wall-to-wall shelves holding the hottest reads. Nothing makes coming home feel better than a home-cooked meal. If you’re just getting to the airport in the morning and need a rise-and-shine bagel, pick up something special at Bruegger’s Bagels, famous for its New York-style and authentic Vermont cheese. Also located in Concourse B food court is Vino Volo, a seated-dining restaurant that offers sophistication on the go. Catch the last quarter of the game by chilling out at Burgh Sportz Bar, famous for holding official sports memorabilia alongside classic food and drinks.